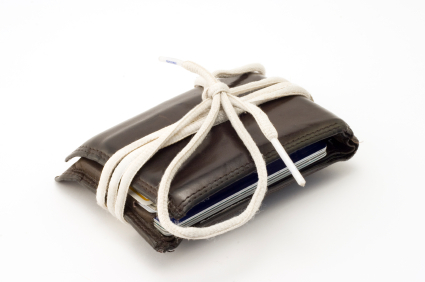 Finding it hard to keep your money in your pocket? With today’s tight job market, rampant student debt, and high unemployment rate, many Americans are in a constant struggle to live within their means. Had you grown up in the Economides household, however, you’d know what it’s like to live on tight budget. Steve and Annette Economides, authors of America’s Cheapest Family Gets You Right on the Money: Your Guide to Living Better, Spending Less, and Cashing in on Your Dreams, may be the definition of shoestring budgeters. The couple acquired frugal-living habits after marrying in 1982. Although Steve was only making $13,000 a year at a printing company, Annette wanted to be home to raise the kids. To make it work, the couple used creative methods to live off one income, such as Annette learning how to sew to make her own maternity clothes. They found that, even on limited financial resources, they could still afford some of the discretionary expenses they longed for; all it took was discipline. “We had to save three months to go out to dinner at Benihana, but we got there,” says Annette. Thanks to their clever spending strategies, the Economides kept their household of seven financially stable on a shoestring budget. Click here to read how they did it. ← Is an Online Financial Adviser Right for You?